We really appreciate our relationship with Mightybytes and have come to rely on them as a valued partner over the years. They are one of the few companies we know with equal expertise in marketing, design and technology. Here’s how we helped a small environmental nonprofit use design, technology, and strategic digital marketing tactics to grow and thrive. Mightybytes nurtured a six-year partnership with Climate Ride, a nonprofit that produces multi-day hiking and cycling events that raise funds for active transportation and the environment. As their go-to agency for all things digital, we helped Climate Ride manage their entire online presence, from their website and online store to social media campaign planning and improving conversion metrics. Pedaling for the planet on Climate Ride California. 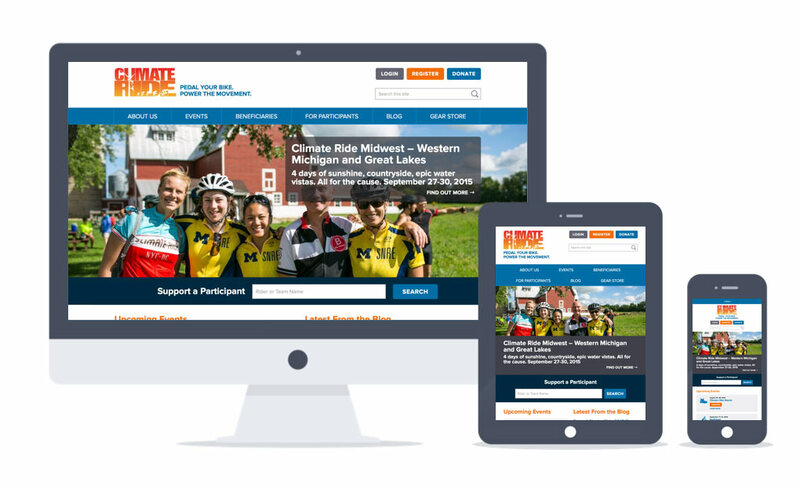 We started our relationship with Climate Ride by redesigning their website to provide a more intuitive user experience for target groups consisting of donors, riders, and potential sponsors. These efforts increased site conversions by nearly 75%. Wireframes for a live Instagram feed that appears on Climate Ride’s homepage during events. In our ongoing work, we helped Climate Ride launch an online store, create and manage social media campaigns during rides, and establish important goals and funnels to help increase online donor conversions and rider registrations. In 2014, we further streamlined Climate Ride’s content strategy and gave their website an update that included improved information architecture and cleaner design elements. The responsive redesign ensures Climate Ride’s stakeholders get a great experience no matter what device they’re on. Climate Ride’s 100+ beneficiary organizations work toward building healthier and more sustainable transportation infrastructures in U.S. cities, conserving natural habitats such as the Great Lakes and our national parks, and promoting environmental education, sustainability, and renewable energy initiatives around the globe. These organizations come to rely on the millions of dollars in unrestricted grants they receive from Climate Ride. We are proud to play even a small role in this inspiring organization’s big mission.